A few days ago I stumbled upon a blog post that had a few mentions of the genius Mr. Einstein. Because I’m a big fan of the man who had such an amazing affect on life as we know it today, I thought what would he do if he was one of today’s entrepreneurs? Would he develop some kind of crazy TV show “The Eisntein TV”? 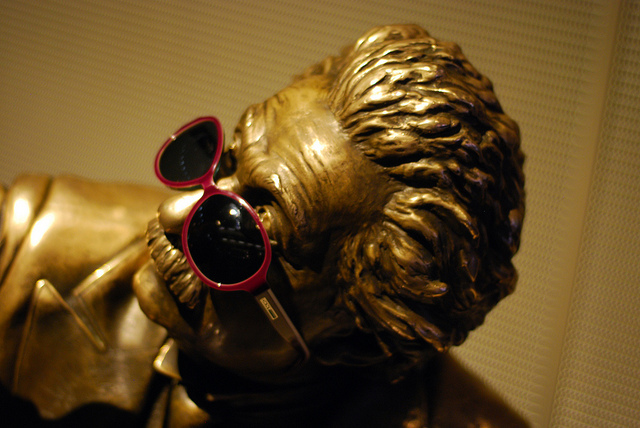 Would he invent the best photo-sharing app, “Einstegram”? I guess we will never know but one thing is for sure – he would have been a successful entrepreneur. Nowadays we call it vanity metrics or other strange names. What Mr.Einstein figured out a long time ago is that perusing success is the best way to fail. It is very hard to be focused on value and how to bring value to the world. In a world where customer or user attention is the most expensive product, the only thing you can do is produce value. It is a lot harder to produce real value to 10 customers than getting some PR articles and having 200 customers to whom you’re giving no value. It doesn’t matter if it’s a new feature/design/investment that I don’t know exactly how the tackle, I am always amazed how simple the answer is. The answer is always the same: Understand what is valuable to the customer/user/company, then the answer is clear. There are too many decisions that don’t have one clear answer; the only way to try and make better decisions is to rely on the data that you analyze in a fanatical way. I cannot emphasize enough how relying on data and not on press headlines made us a better company. I am still making tons of mistakes but looking at our customers and the company’s nature leads to a lower ratio. When writing these lines I am not sure you are supposed to listen to anything I say. I really believe that in my last year I learned a lot and I am not even close to teach anyone. I am simply trying to share my mistakes and lessons, so you really don’t have to agree with anything. That being said, I learned that “over acting” about your success or product doesn’t help. The smart people you want to join your roller coaster will see right through it. Lets take raising money as an example: In order to raise money you need to learn something first about your primary assumptions. I learned that it is ok to say: “that didn’t work because….”. You just need to have a good reason and proof that you actually learned something in the process that will make your company better. In the end it is all about people. I learned that every day has its good and bad moments but it is important to take everything with a smile. If you don’t choose to work with employees/investors/partners that you have fun with, well, lets just say that I wouldn’t have survived it. Startups are in the business of people, having fun with people is one of the most important things.